The COSTA COMPAGNIE conducted research in the Hindu Kush for three weeks at the end of ISAF’s mission and spoke with Afghan activists, journalists, scientists and students, as well as with German and American soldiers and diplomats about their experiences within the region’s complex situation. CONVERSION translates the multiple voices and contradictions of the material into a powerful performance that blends contemporary dance, research-based theater, soundscapes and multimedia installation to create a new form of the messenger’s report, while pursuing questions such as: How did the ISAF-mission affect the situation in Afghanistan? And by which interdisciplinary means can we approach war? She wrote that all the material she had collected could not provide “documentation”. Documentation always aspired to completeness, to truth. But even if everything was based on documentary material, what it reflected was more an emotional state. She wrote that it was impossible to create a representation of reality. Every individual had a different system of personal values and ideas which orders the world for them – and the challenge of a place like Afghanistan is that the sheer number of complex contradictions and mutually exclusive moral situations is so overwhelming that one has no alternative than to abandon everything one ever thought before. You have to open up a new area where you try to think of reality. Because in Afghanistan you are permanently and offensively confronted with the positive and negative actions of the West. “(…) Among all the listed proposals for theater visits was one production, which pursued the very question of art, politics and political action in a profound, courageous and at the same refreshingly open and highly conrete way, as it has not previously been seen before: ” Conversion – After Afghanistan” in an overcrowded Ballhaus Ost by the independent group Costa Compagnie (…). Performance: With “Conversion_2”. 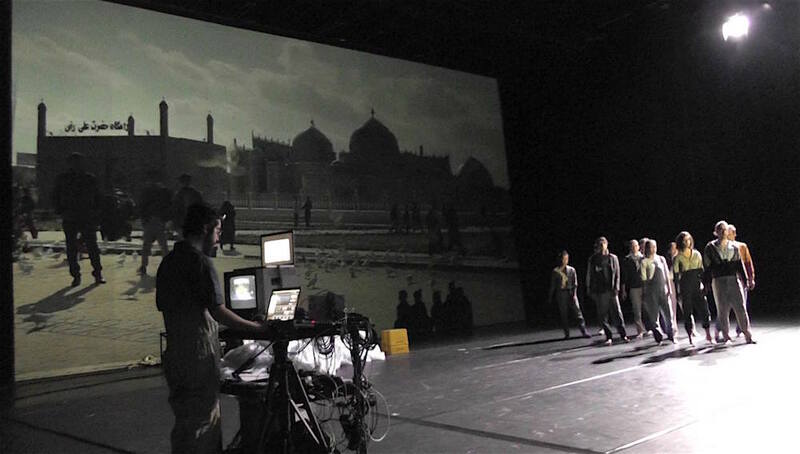 After Afghanistan.” the Theater Heidelberg presents a remarkable theatrical experience. The Hamburg based costa compagnie sets foot on the traces of these contrarieties, hopes, experiences and fears of the Afghan population and interim-occupants in their performance „Conversion_2. After Afghanistan.“. A dance-performance within the overall project „Conversion. A German-American Chogeography.“ in cooperation with the Theater and Orchestra of Heidelberg, where the piece premiered. Shortly before the international military mission in Afghanistan „ISAF“ ended in December 2014, artistic director Felix Meyer-Christian, choreograph Jascha Viehstaedt and cameraman Stefan Haehnel set out to research on-site: In the cities of Kabul and Mazar-e-Sharif and within two NATO-camps they spoke with over 30 Afghans as well as German, Dutch and American soldiers and collected video- and audio recordings all around. Documentary and essayistic texts, video-tableaus, dance and sound composition now merge within CONVERSION_2 into a theatrical reflection of this trip. The many-voiced texts are mostly brought forward by the performers (Hauke Heumann, Hans Fleischmann, Florian Mania, Nanette Waidmann) and sometimes directly delivered from the videos. But also the dance is multi-formed: Frank Koenen, Akemi Nagao, Jascha Viehstädt and Maria Walser change between impulsive shows of strength, subtle physical seclusion, rhythmic-eruptive chaos and a harmony searching synchronicity. One of the strongest moments might also be the most disturbing one: The dancers perform a boygroup-choreography while the theater’s children’s choir (which also took part in the earlier performance installation around the theater) sings „Colors of the Wind“ alongside the actors, a song which was written for Disney’s „Pocahontas“. „Conversion_2“ does not choose an easy path – not for the group nor for the audience, as the spectator is confronted with a surge of opinions and images (at the end of part 1 a gigantic, inflated plastic tube overgrows the entire stage). Meanwhile the costa compagnie does not try to explain the world to the audience. Instead, they very effectively and powerfully document the kaleidoscope of an heterogeneous Afghan present on the way to an uncertain future by artistic means. A remarkable achievement. “Conversion_2” at the Theater of Heidelberg: Afghanistan, quo vadis? “Nothing is good in Afghanistan.” In 2010, this brave sentence by Margot Kaessmann stirred up a lot of criticism in the public debate, as she as was the chairman of the Protestant Church in Germany. But maybe this statement helped to question complex matters and to break free from habitual patterns. The same approach is tested by a joint production of the Hamburg based costa compagnie and the Theatre of Heidelberg, which runs under the title “Conversion_2. After Afghanistan” and which just premiered on the theater’s big stage. The dance-performance is the second product by the collaboration of the two companies, who already have released “Conversion_1” in 2014, a performance which deals with the drawdown of the US-forces from Heidelberg. Before the international military mission in Afghanistan ended in 2014, three artists of the costa compagnie traveled to the Hindukush. They conducted interviews with the locals, but also with soldiers and asked for their experiences and feelings regarding the past and the present. A present, which has to acknowledge, that its coordinates are changing without anyone being able to tell how it is all going to end one day. With the intention to develop new forms of documentary and choreographic working, a dance-performance out of the collected material was created, as a subjectively observed snap-shot of Afghanistan. The performance, for whose text and artistic direction Felix Meyer-Christian is responsible, therefore does not seek to – and cannot be – a documentation in its narrower sense. As the performance understands itself as “interdisciplinary”, it works with the artistic means of contemporary dance (choreography: Jascha Viehstädt), video on different surfaces and presents a sometimes quiet abstract sound environment of everyday-sounds, of military environments, as well as composed music. Even the “Alte Saal” (smaller, traditional stage) and the foyers are integrated, with installations and appearances of the children’s choir singing “Im Früh taut zu Berge”. On stage, actors take the parts of the interview partners and present themselves as messengers of an unknown world that displays itself as multi-faceted and contradicting and often as diffuse. Critics of the conventional image of women in Afghanistan come to speak as well as advocates of the Taliban and the Sharia, soldiers of the ISAF troops as well as Afghan civilians. In passionate dance sequences one senses traumatic experiences, when the performers in distressed movements appear as to be running against an invisible wall. The performance leaves one stunned and a little overwhelmed, as during the dense construct of breathlessly changing scenes and fragments one sometimes loses orientation. Still: The sorrowful question is articulated very clearly and impressively towards the end: Afghanistan, quo vadis? The group succeeds with enthralling images and haunting situations, especially within the dance parts, for which the Hamburg-Heidelberg ensemble is to be praised. The audience appeared to be also taken with the presentation with a long and affectionate applause. Guest-Performances at the Frances Daly Fergusson Dance Theater / Vassar College, NY, USA are supported by the Nationales Performance Netz (NPN) International Guest Performance Fund for Dance, which is funded by the Federal Government Commissioner for Culture and the Media on the basis of a decision by the German Bundestag.